Establish Your Topic: Pick a “beginning” or “starting out” topic that’s relevant to readers in your niche. Starting out can be as basic as ensuring you have particular tools before you begin a task. It can also include advanced topics, like performing particular actions in a chronological sequence. Introduction: In 1-2 sentences, describe what starting out felt like – did you feel confident, scared, or even excited about your prospects? Use this emotion as a compelling, relevant hook for your readers. Next, did your plan work or did you discover any invaluable lessons the hard way? Tie this into how and why your step-by-step recommendations will benefit the reader. Chronological List: Write step-by-step instructions in sequential order to help your readers start off on the right foot. Keep each step succinct while painting a clear image of the step or process. Tip: Whether it’s a caution or a last piece of advice, tie it all together with one last cohesive tip. Perhaps it’s reiterating the importance of a step or tool. It could even be motivational, like staying determined, patient, or maintaining quality. Conclusion: End on a positive note that will inspire your readers to spring into action now that they have a great step-by-step process to begin their journey. 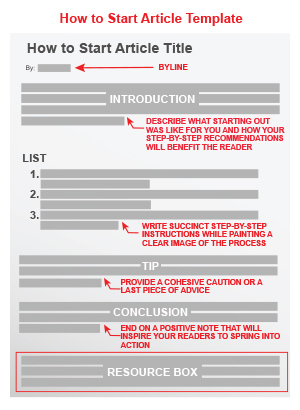 Ease the process of starting out for your readers by using this article template. In doing so, you’ll be able to create an article that benefits your readers as well as builds exposure, credibility, and traffic for yourself. Take the guesswork out of writing articles with the EzineArticles’ 52 interactive Article Templates on PDF. Click here to easily begin building a quality, original article portfolio today. When the starting is well ending is definitely well. Thanks!! Great Article. Getting started has to be one of the hardest things to do and why a lot of people get writers block, once you can get that intro paragraph written the rest usually falls into place quite easily, thanks for the helpful tips! What goes in the resource box? Your Resource Box is the appropriate place to include information about yourself and/or your business. You may include up to 2 self-serving links to your personal and/or business sites in your Resource Box, if you wish. thanks for this help full article. This is something that plagues alot of beginners who want to try something new. But you can easily relieve this for your prospects by offering a step-by-step blueprint or “fast action” plan that will get them going. Getting going is the hardest part. Great Article and so true. The beginning is the start of any great journey. It is love at first sight. It is the dawn, the first light of the day. It is the first thing everyone will see on your ads and articles, make it shine. Well said, the beginning of every thing including writing an article is the most difficult, but once that is taken care of every other thing will be aligned. Flow of article is really matters. I also love to read article which have good flow. I have also came across that some of article which doesn’t have good flow. It is just like classified. As a user I love to read article which have informative content. Great article. It offers support for my clients who want to write, but they always have WRITERS BLOCK! Sometimes it’s not easy to start an article. What I usually do is just start writing a paragraph and just review and adjust. Template is my day to day guide to start writing fresh and new content on my page.